This is going to be pretty nice. They missed that across the street Google is building a new structure in that parking lot. My friend worked on that building and it sounds FANTASTIC. He worked on it (the new Google building)? What stage is it at? MidTowner Wrote: He worked on it (the new Google building)? What stage is it at? I believe they were finishing renders last I knew. Probably some other work to be done. It's very artsy. Will be a great addition to town. This looks fantastic, hopefully this project sells well and what we see is what gets built out. I also love the look of the office building and how it is not set back. Even though I was a fan of the original renders this feels more complete and an all around improvement, was worth the wait. Here are some details from The Record. Mark me down as impressed! Quote: The development includes paths so people can easily walk or cycle from Walter Street, through the Sixo site and connect to the transit hub and downtown, Zehr said. The design includes a large outdoor area, with fountains, patios and an outdoor amphitheatre, between the buildings on the site. The render shows cars driving from Moore into the office building underground parking? Looking at the area live, Grandlink has built a retaining wall at that spot. Are they going to rip up that wall in a few years for this development? (05-19-2017, 09:49 PM)Square Wrote: [ -> ] The render shows cars driving from Moore into the office building underground parking? Looking at the area live, Grandlink has built a retaining wall at that spot. Are they going to rip up that wall in a few years for this development? They’re going to demolish several existing buildings and excavate a one-block area to a depth of multiple stories. Any retaining wall isn’t even worth mentioning. Are you sure they put a retaining wall there? I thought Moore was still going to be an access to the plaza (as it was before). On the topic of retaining walls, I really hope whoever redevelops the McDonalds takes the grade of the entire site down 3 metres. That retaining wall is huge. It's like the McDonalds is on a pedestal. 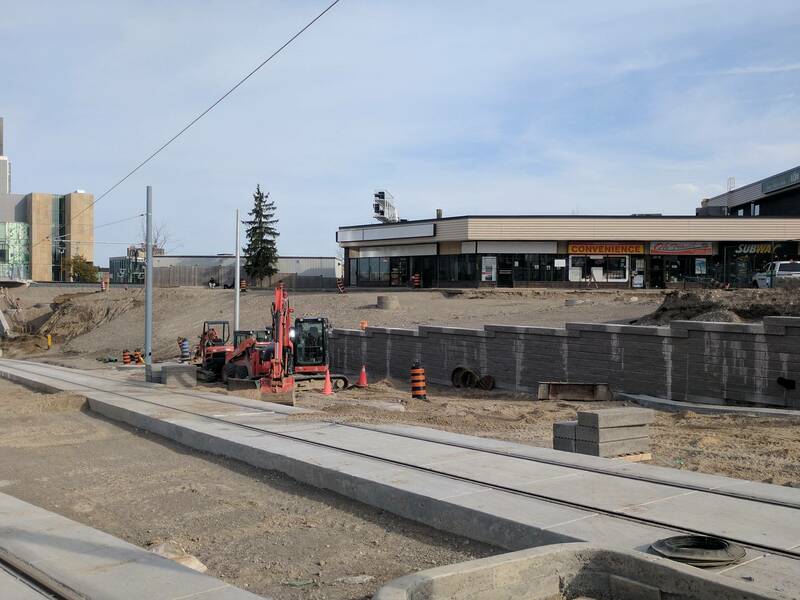 In a photo from Greg Papazian In I support Light Rail Transit in the Region Of Waterloo Facebook page, it shows the retaining wall directly across the new rebuilt Moore Ave. I wonder what Galloway means by "Another just in for suburban ION stn." The midtown neighbourhoods are going to be 'streetcar suburbs' once more! I think he means there's been another submission for a suburban ION station which isn't public yet. He's tweeted about there being a big development planned for Block Line that's going to be integrated into the station, maybe they just submitted planning documents. I presume some kind of typo? He probably meant 'justification for urban station', or something. Presumably, yes. Despite the retaining wall being there, the curbs for King St curve towards the retaining wall at that entrance, as if there is already an entrance there, but with a mysterious wall in the middle of it. Odd that they would have spent money on a "permanent" wall rather than just some easy-to-dismantle boards or something.